The leaders of the two Koreas have been invited to next month's Asian Games in Indonesia, Jakarta said Monday, after the neighbours agreed to field several joint teams at the event. Indonesian president Joko Widodo sent a formal invitation Friday to South Korea's President Moon Jae-in and North Korean leader Kim Jong Un, Widodo's spokesman said, but it was not immediately clear if either has responded. "The invitation letters have been sent to the leaders," spokesman Johan Budi told AFP. Last month, Asian Games organisers announced that North and South Korea will field joint teams in three sports -- canoeing, rowing and women's basketball -- in a sign of thawing tensions. 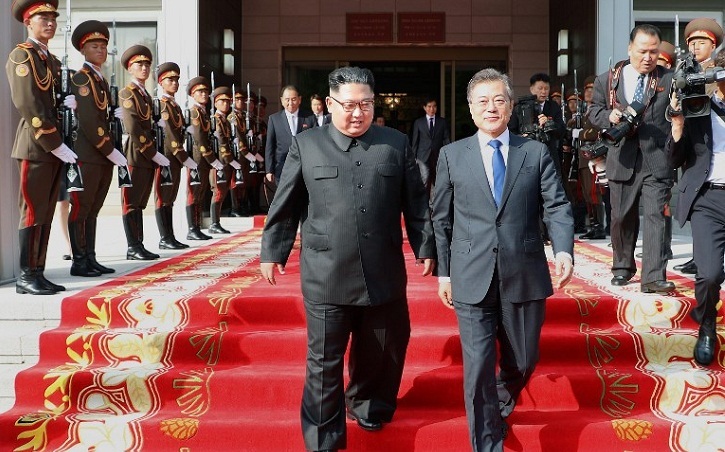 The two countries -- which are technically still at war after the 1950-53 Korean War ended with an armistice instead of a peace treaty -- will also march together at the opening and closing ceremonies for the showpiece event from August 18-September 2. The two Koreas formed their first-ever unified Olympic team -- a joint women's ice hockey squad -- for last February's Winter Games in the South, with the North's participation kicking off a thaw between the two neighbours. The diplomatic detente also triggered a rapid improvement in relations between Pyongyang and Washington, culminating in last month's summit between North Korean leader Kim Jong Un and US President Donald Trump in Singapore. The Asian Games, to be held in Jakarta and Palembang on Sumatra island, will feature some 11,000 athletes competing in 40 sports -- the second-biggest multi-sport event behind the Olympics.